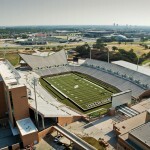 The University of North Texas’ (UNT) Apogee Stadium – the first newly constructed collegiate football stadium in the nation to earn LEED Platinum certification – opened in Denton, Texas, in September 2011 as the new home of Mean Green football. 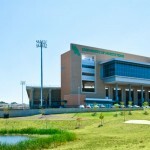 To earn this elite certification from the U.S. Green Building Council, architects at Dallas-based HKS, Inc., incorporated any number of ecologically friendly design elements in UNT’s $78-million 30,850-seat stadium, including selecting renewable and recycled construction materials, reducing energy and water consumption, and reducing CO2 emissions through the incorporation of three wind turbines to generate power. 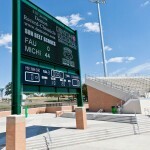 While environmentally conscious, the collegiate stadium – which was built on 46 acres and is uniquely designed as a horseshoe-shaped bowl – also features several high-end elements, including: two state-of-the-art video boards, 21 luxury suites, 750 club-level seats, a high-tech press facility, banquet rooms and a team apparel store. “The athletic department and university facilities group wanted something contextual but that would push the limits of what they could get for the money,” said Jim Herckt, AIA, LEED AP BD+C, project architect at HKS. 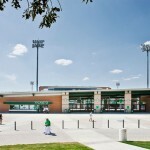 HKS turned to the Dallas office of Manhattan Construction Co. to serve as general contractor for UNT’s Apogee Stadium. 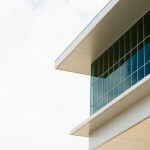 (The two companies previously had worked on design and construction of the new Dallas Cowboys Stadium, which opened in 2009 in Arlington, Texas.) 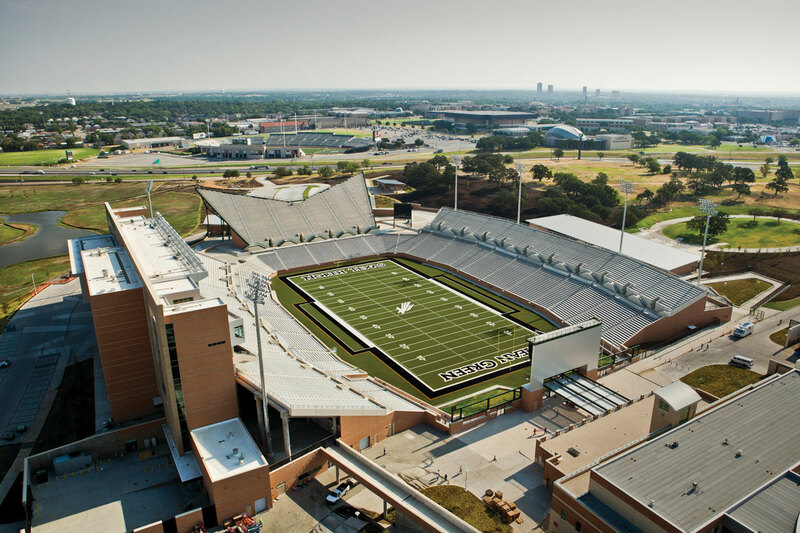 This project took a very collaborative team approach throughout the design and construction process in order to meet UNT’s 50-year facility requirement for the new stadium, according to Herckt. 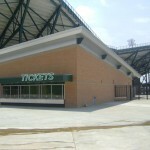 To create a cohesive look with other campus buildings, brick was utilized to construct stadium walls. 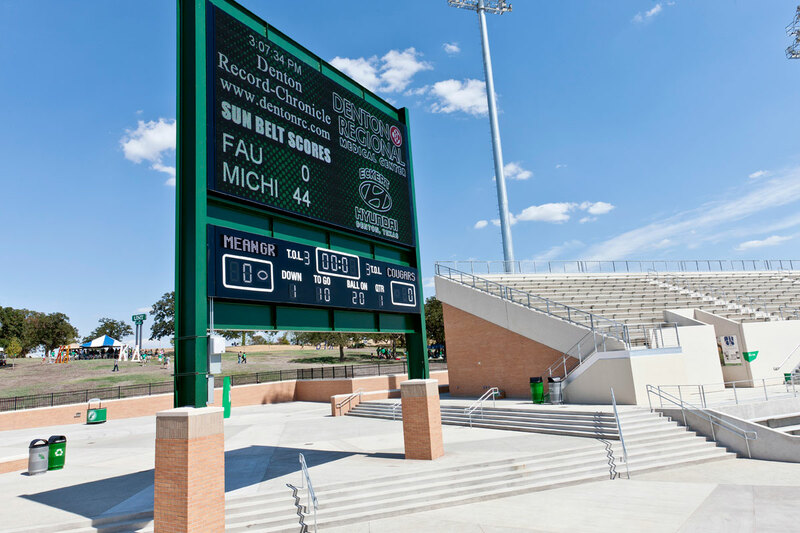 Recyclable Alucobond® aluminum composite material (ACM) by 3A Composites USA was installed as a unifying design element throughout the stadium. 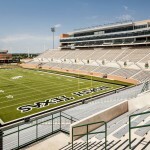 A total of 49,754 square feet of Alucobond in the 4mm thickness was installed in two colors on the UNT stadium, including: 48,320 square feet of the Sunrise Silver Metallic color and 1,334 square feet of custom Mean Green. 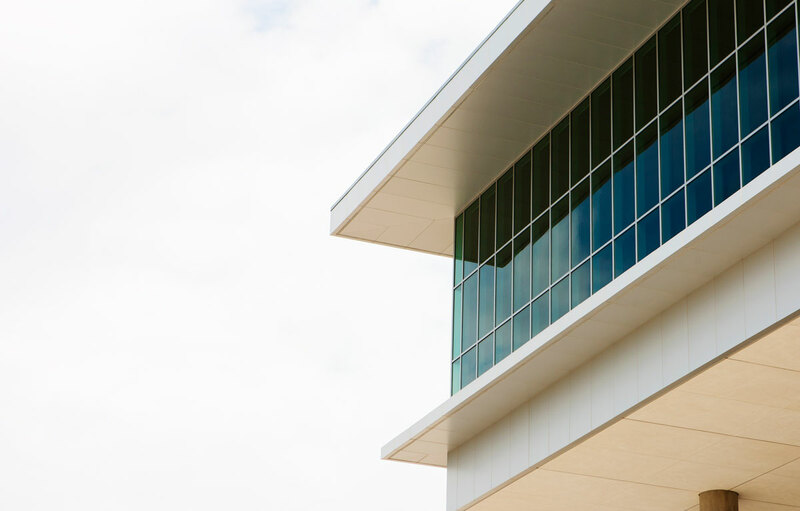 Alucobond in the Sunrise Silver Metallic color is installed as cladding on the press box, suites and club exteriors and as fascia beneath canopies. 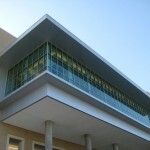 Alucobond in the custom Mean Green color is installed as a design accent in areas such as ticketing booths and behind the 15-foot by 27-foot north end zone video scoreboard. 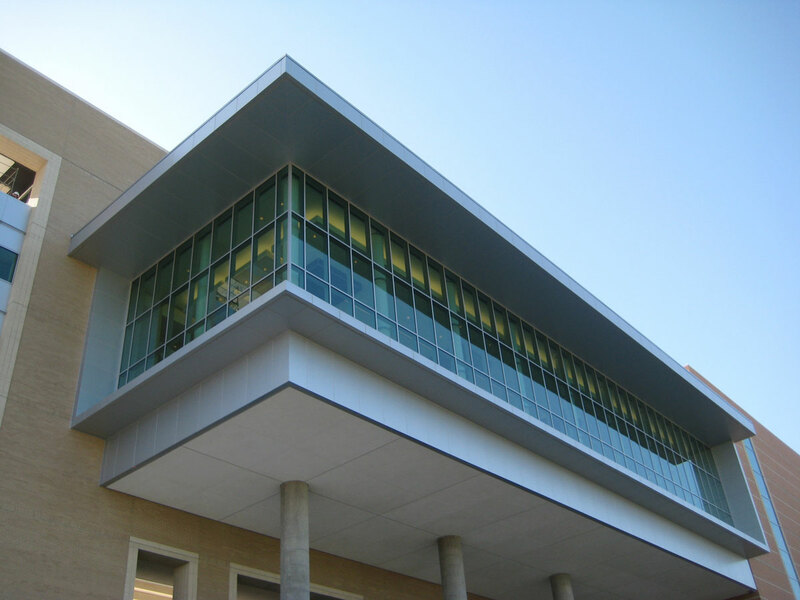 3A Composites USA is well-known for its color-matching capabilities; and, the ability to color match the custom Mean Green (one of the university’s official colors) was an important factor in the selection of Alucobond as stadium cladding, according to Herckt. 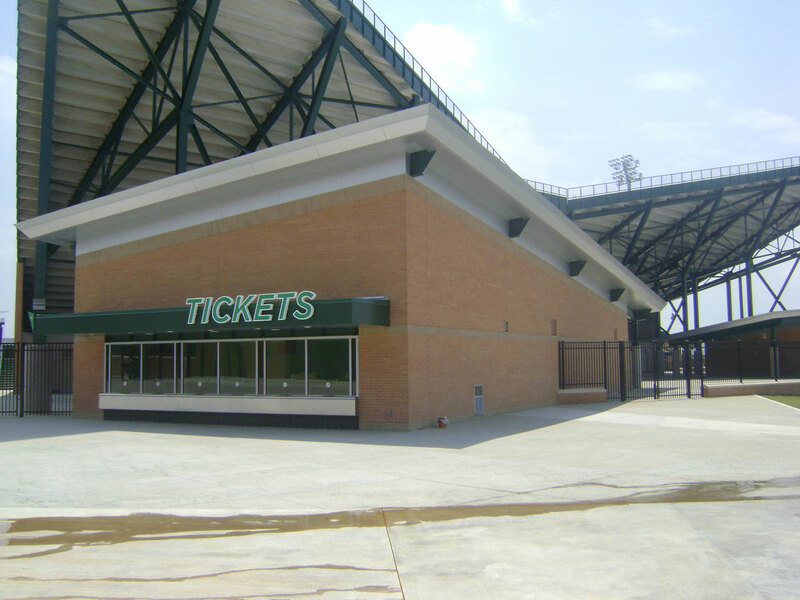 Le said NOW Specialties was challenged to fabricate Alucobond panels in a cantilever design for the stadium’s upper-level club area and then install those panels above tiers of flat metal-bench bleacher seating. 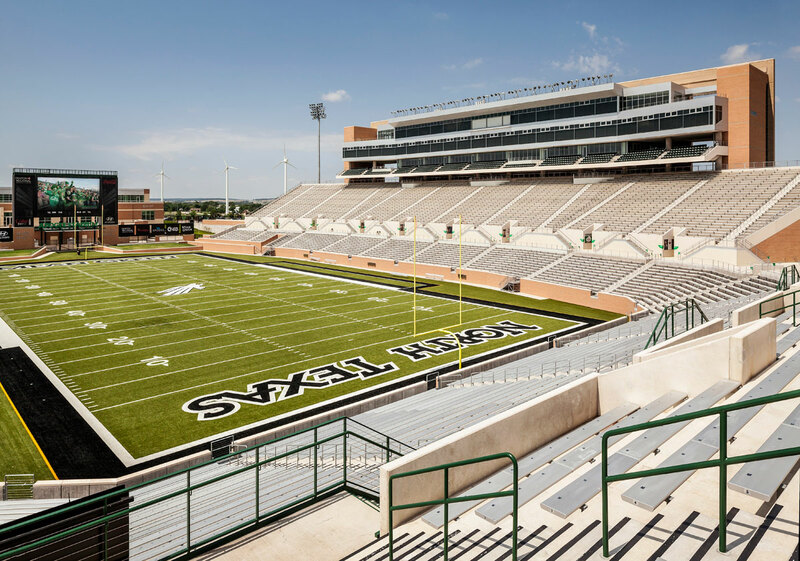 “We were able to give the university the best bang for the buck and produce real-world savings,” according to Herckt, who said the UNT stadium project’s original intent was to meet LEED Silver certification guidelines.